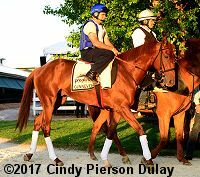 Multiplier watches Senior Investment walk towards him on Thursday morning. 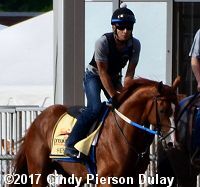 It was very warm and sunny this morning with a few scattered clouds at Pimlico as the Preakness horses came out to the track. Kentucky Derby winner Always Dreaming went out before sunrise at 5:30 again. All the horses were out today, so I will present them in the order they went to the track. Click on the small photo to see a larger version. Preakness Weather Forecasts - Saturday looks good, but Friday might be hot and wet. 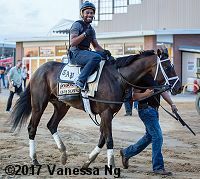 Always Dreaming galloped 1 1/2 miles under exercise rider Nick Bush at 5:30AM. 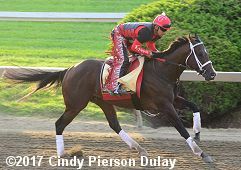 Trainer Todd Pletcher said, "I thought he had a very strong, enthusiastic, contained gallop. He's giving us a great feel and shown us everything we're hoping for, leading back in two weeks. The tank seems full. He seems eager to go. We're just trying to keep him on the ground one more day. I would imagine that (Classic Empire is) going to target us and the target is right next to you. It probably gives him a little bit of a tactical advantage from that perspective. 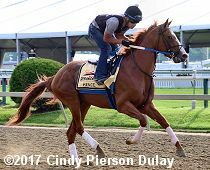 We're just focused on hopefully breaking cleanly and smoothly and letting him run to the first turn a little bit." Senior Investment jogged and galloped at 5:45AM. Trainer Ken McPeek said, "I had him go to where the race starts and then broke off into a gallop. He's doing great. The post is good. I'm happy." Jockey Channing Hill added, "It's a good post, but to be honest, the post isn't a big deal with him. Any post would have been perfect. He's obviously very place-able and does whatever I ask him. 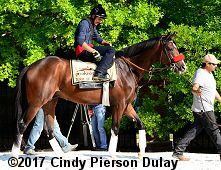 I don't think he could have won the Louisiana Derby, but he had an inside trip and I've learned to keep him clear. I don't have to be outside with him, I just have to keep things out of his way. After the Oaklawn win, I have been very high on him. I thought I was going to win by a length that day and he really sprinted out. He really has great turn of foot. Last out I had plenty of horse left after the Lexington. He really galloped out. I don't know about other peoples' horses, but I know my horse will do what I want and nothing fazes him. I think I have a legitimate chance to run 1-2-3." 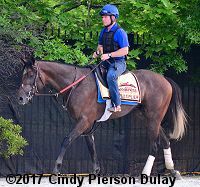 Multiplier galloped 1 1/4 miles under exercise rider Asrael Gonzalez. 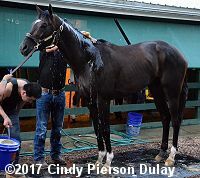 Trainer Brendan Walsh said, "I wasn't thinking about it last night, but he actually had drawn the 1 in the Illinois Derby as well. So I don't think it's going to make that much of a difference with 10 runners. On his last run, I think he fits. If the pace is slow, he'll be closer. If not, he'll be a ways farther back. He'll come running at the end. I'm sure of that. He's a fresh horse again. He's had some time since Illinois (four weeks). I've had a couple of Breeders' Cup runners (Daylami and Fantastic Light as an assistant to Saeed bin Suroor), but this is my first Classic runner, so it's very special. This is where every trainer wants to be. Hopefully it's the first of many. You'd like to have horses like this every year." Gunnevera galloped once around under exercise rider Victor O'Farrell. 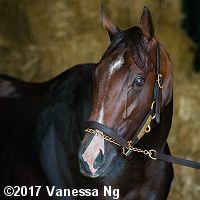 Trainer Antonio Sano said, "For me, he is better than he was before the Derby, stronger. He likes this track and the weather Saturday looks good." New jockey Mike Smith gets the call Saturday. 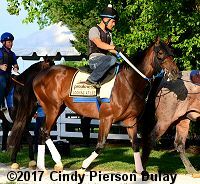 Classic Empire jogged 1 mile and then galloped 1 mile. 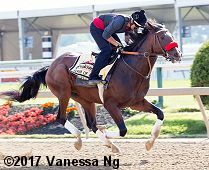 Trainer Mark Casse said, "He was focused and happy. I walked him out to the track this morning and he was eager to get there. Sometimes he's not as eager, especially this winter. You wait 37 years for the biggest race in your life and it's over in 10 seconds. Oftentimes there's jostling and bumping kind of like offensive linemen, but we got hit by a linebacker. He's Rocky Balboa, the champ got knocked down but not out. This race is not about revenge. Nothing against Always Dreaming, if we don't win I hope they do. 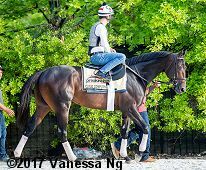 I love [Always Dreaming and Classic Empire] being side by side, and I like it a lot better that we're outside and he's inside. The start's going to be important. It allows us to have more options." Lookin At Lee schooled in the starting gate then galloped once around in the morning, then schooled in the paddock in the afternoon. 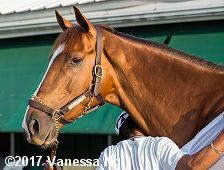 Scott Blasi, assistant to trainer Steve Asmussen said, "We walked quite a bit, just let them look around and relax. There was kind of a nice breeze out there. It was a lot cooler out there than back here at the barn. We went for a little stroll, stood in the gate and galloped a mile. They were great in the gate. The gate crew here is awesome." 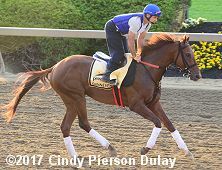 Cloud Computing galloped once around on Thursday morning and schooled in the paddock in the afternoon. 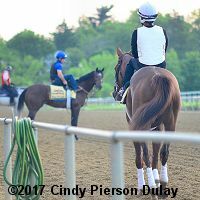 Jose Hernandez, assistant to trainer Chad Brown said, "When I first came to Chad, I was a foreman and then became an assistant. I've been traveling with his horses for seven years already � Arlington, Santa Anita, wherever he needs me. It's an unbelievable job. I love what I do, and Chad is a nice guy to work for." Before joining Brown's team 9 years ago, he worked for D. Wayne Lukas and Todd Pletcher. Hence schooled in the starting gate then galloped once around in the morning, then schooled in the paddock in the afternoon. Scott Blasi, assistant to trainer Steve Asmussen said, "Steve thinks he just hopped up and down in the slop. The forecast is good and hopefully he has a more honest account of himself. He's a beautiful horse, and both horses are traveling beautiful." Term of Art jogged 1/4 mile then galloped 1 1/4 under exercise rider Johnny Garcia. 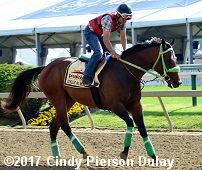 Sabas Rivera, assistant to trainer Doug O'Neill said, "The rider said he feels good. He handled the track very well. He wasn't breathing hard." O'Neill added, "We hope he's going to have a future." New rider Jose Ortiz gets the call Saturday. Conquest Mo Money galloped 2 miles under jockey Jorge Carreno. Trainer Miguel Hernandez said, "It's like a dream for us to come this far, this fast, to be a trainer. I've never thought about having a stakes horse like this and being here. I didn't want to be in New Mexico forever and never come out. To come here is totally different. You know a lot of people, the big guys like Steve Asmussen, Todd Pletcher. I'm honored to follow those guys and learn from the big trainers. This is a good experience for us. The people are really friendly. The horses are totally different, really classy stakes horses. It's really nice."